There's a lot to love about the latest iPhone's photographic abilities. In our iPhone XS camera review we praised it for having decent optics and powerful post-production power. But it seems that the post production is too much for some, with various Reddit threads pointing out that the camera's intelligent photo processing is just too much, with users not happy with how it 'beautifies' its subjects with skin smoothing and the like. This was a big part of Apple's iPhone XS reveal - its camera capabilities and the fact that is A12 Bionic chip has the capabilities of improving an image - coupled with the handset's image signal processor (ISP) - after it has been taken, with the phone able to make a trillion operations per photo. Depth Control and Advanced Picture mode are the two biggest features of the front-facing camera but it looks like there may be a fix on the way to make sure that the processing of the images isn't too 'aggressive'. Certainly, in our tests we were impressed with the effects noting: "We found the post-shot blurring to really be effective and makes the image look better – it worked particularly well if there’s strong light in the background of the shot." This did come with the caveat that it "isn't perfect, though". Which can be said for a lot of cameras that automatically improve images. 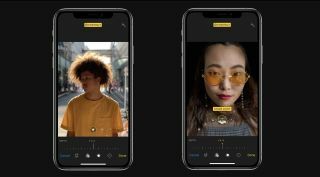 It's unclear whether this fix - if it comes at all - will be bundled into iOS 12.1, which is said to offer users the ability to change picture depth when taking pictures and not just after the picture is taken. These are the best camera phones available now.